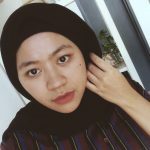 If you’re headed to Johor Bahru, or JB as the locals call it, I cannot imagine you wouldn’t want to explore and know more about this vibrant city. It is, after all, ONLY the third largest city in Malaysia. Naturally, being a foodie, I believe that the best way to get to know a particular place is through the food. 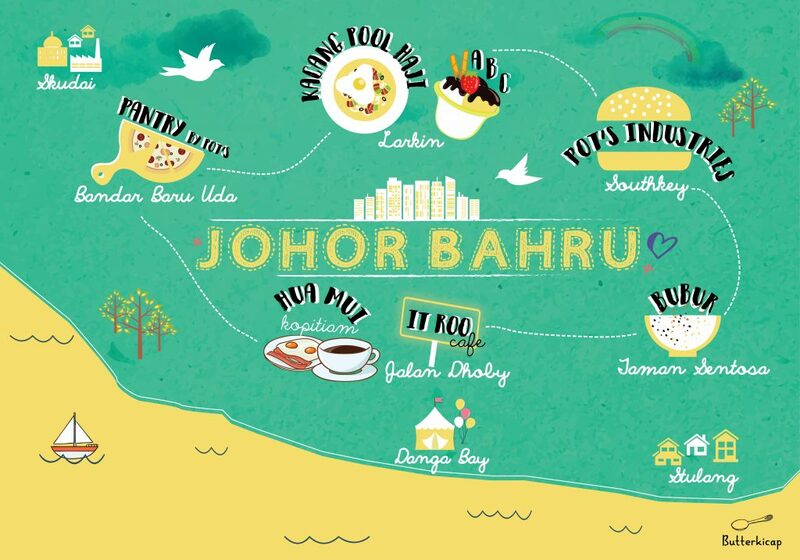 There are just so many places in Johor Bahru that will surely satisfy your hunger as well as inspire you to explore the more interesting sites in Johor Bahru. 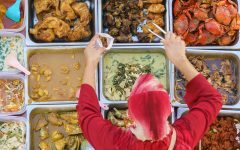 I’m so pleased to present to you, the first series of Butterkicap’s Insider’s Guide to The Best Local Food Places in Johor Bahru. May these lists, recommended by Johorians themselves, provide you with just a sampling of the many local food places that you should try. 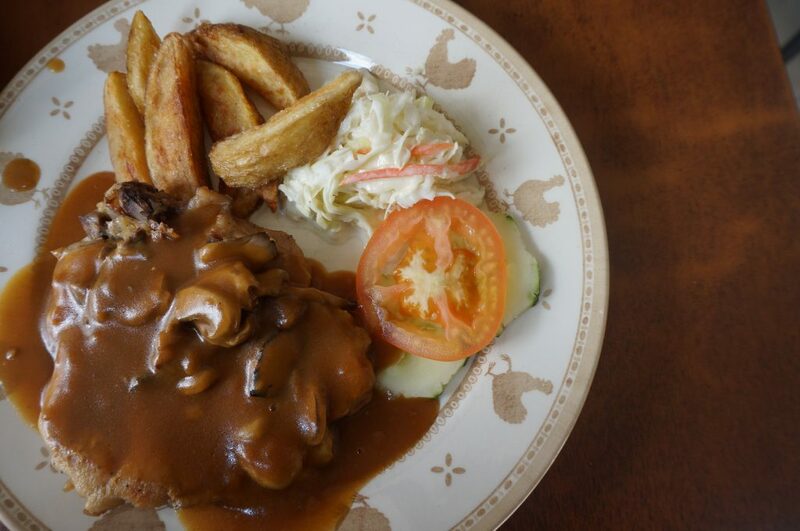 IT Roo is at the top of the list for the best chicken chop in Johor Bahru! 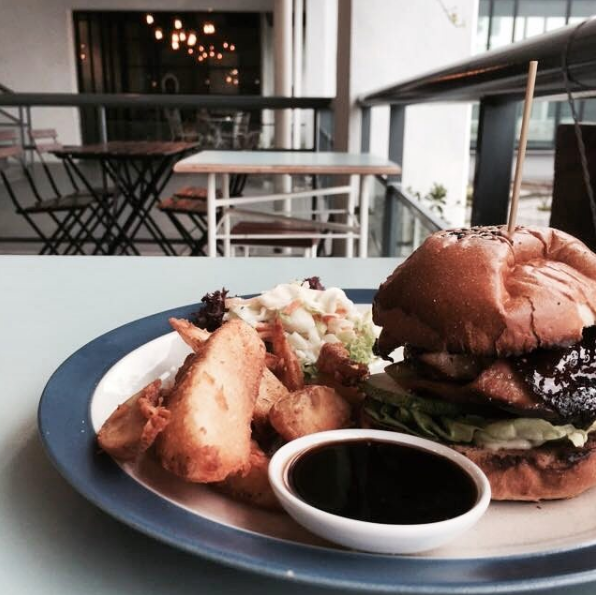 The café is located on Jalan Dhoby along with a row of various cafes and clothing boutiques. IT Roo’s star dish is, obviously, the chicken chop which you can choose to have served fried or grilled. They also give you the option of a mushroom or black pepper sauce. While the price at first glance may seem average at RM16, I think that it is value for money. Your generous portion of chicken also comes with a side of coleslaw and potato wedges. Overall, the pricing at IT Roo is affordable for those who have specific budget for travelling. 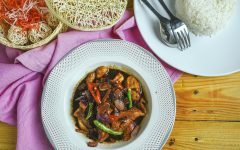 If you don’t feel like eating Western food, other notable items on their menu include standard local favourites such as fried rice and fried bihun. Having just recently visited IT Roo, I advise you to either book your seats or come early to this café is usually a full house. 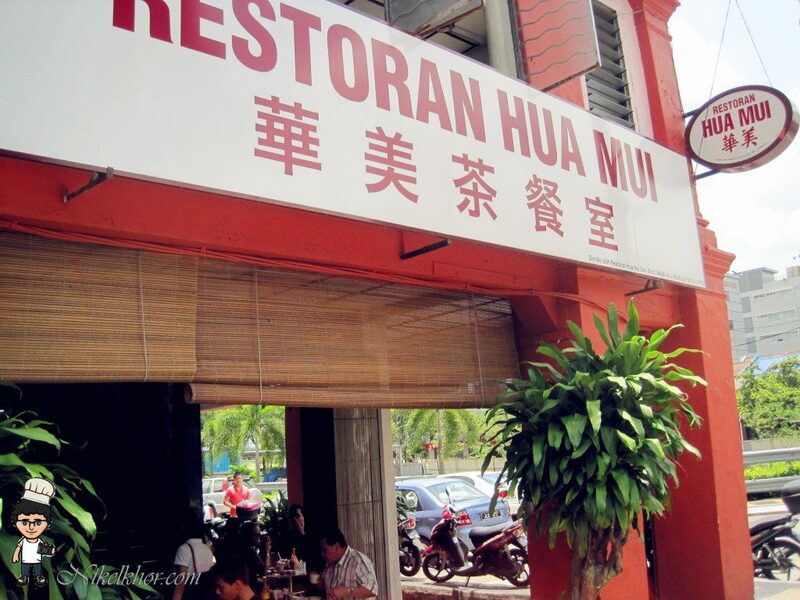 Hua Mui Kopitiam is located near the vicinity of IT Roo café, which is basically the center of Johor Bahru. Entering this Kopitiam is like taking a step into the past to a time when women wore Kebaya everywhere they went and people were crazy about the doing the twist dance. If you decide to come here, I highly recommend trying their simple but classic breakfast. It will surely make your tummy happy. 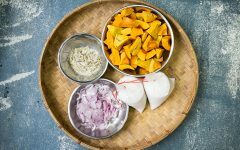 A standard Hua Mui Breakfast will typically cost you RM7.90 but has enough nutrition to get you started on your adventure in Johor Bahru! 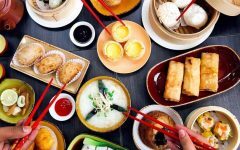 There are also toasts and buns served in a variety of different ways – cheese and kaya toast, butter and kaya toast, kaya and margarine bun, cheese and kaya bun and many more! To round out any meal at Hua Mui Kopitiam, it is vital to try everyone’s favourite drink in the morning; a hot steamy cup of coffee. 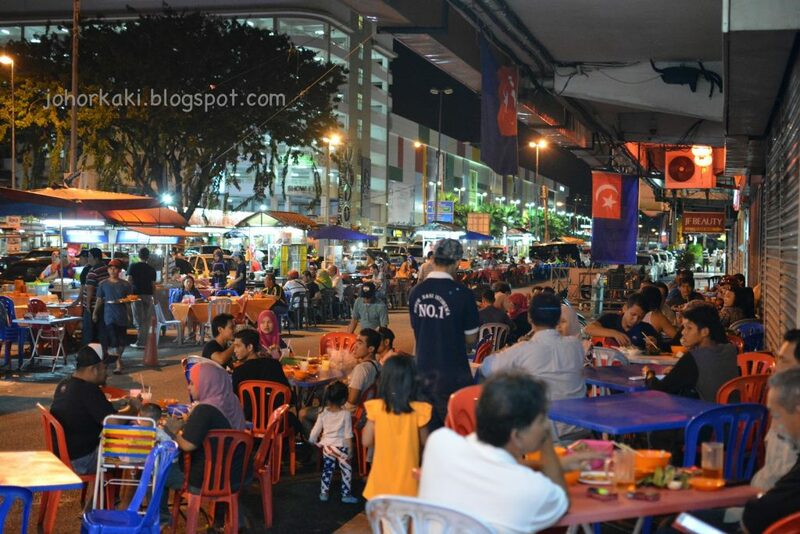 Johor Bahru is famous for its kacang pool and the most delicious kacang pool that you will find is in Larkin near the fire department (bomba). Look for a shop called Kacang Pool Haji. 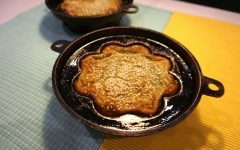 The thick kacang pool gravy is served with a half-cooked egg on top as well as a thick slice of toasted bread. They also have half wedges of kaffir limes which you can squeeze over your gravy if you are looking for a richer flavor. The best news is that the price for a set of kacang pool is only RM6! 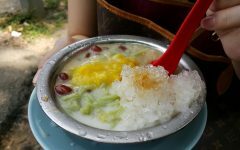 Air batu campur, also known as ais kacang, is one of the most popular treats served in Larkin near the fire station. The must-try delicious ais kacang is topped with a scoop of ice cream of any flavor you choose. The various flavors include vanilla, chocolate and mango (which is my personal favourite). 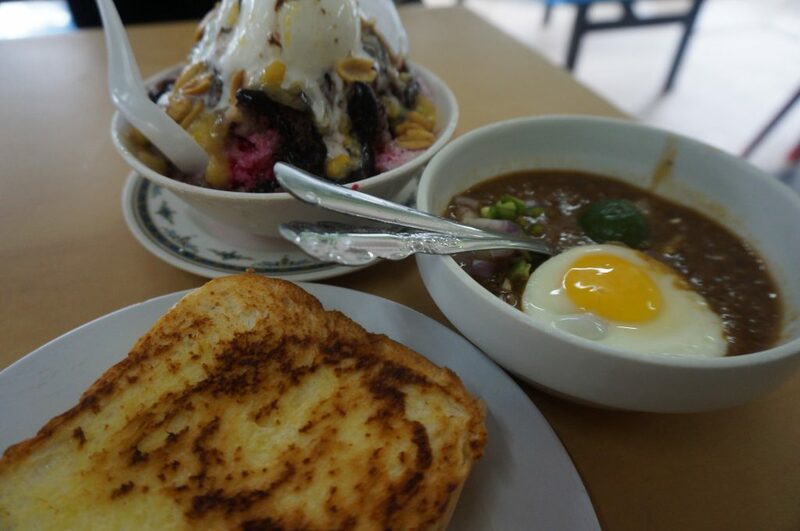 These special ais kacangs can be found at Awiet Corner the same row with Kacang Pool Haji food-court. The words, “An Acquired Taste”, is written on the window of this café that is located at Kota Southkey, Johor Bahru. Pot’s Kitchen is definitely something else. They offer a variety of food choices that will make you go “omnomnom”. At Pot’s Kitchen, you can find tasteful desserts such as cakes, brownies and cupcakes as well as delicious Western standards such as pasta, sandwiches and burgers. Best of all, Pot’s is a photographer geek’s dream come true. The environment of Pot’s Kitchen is Instagram post worthy for sure! Pantry by Pot’s is located in Kilang Bateri, one of the coolest places to hang out in JB. 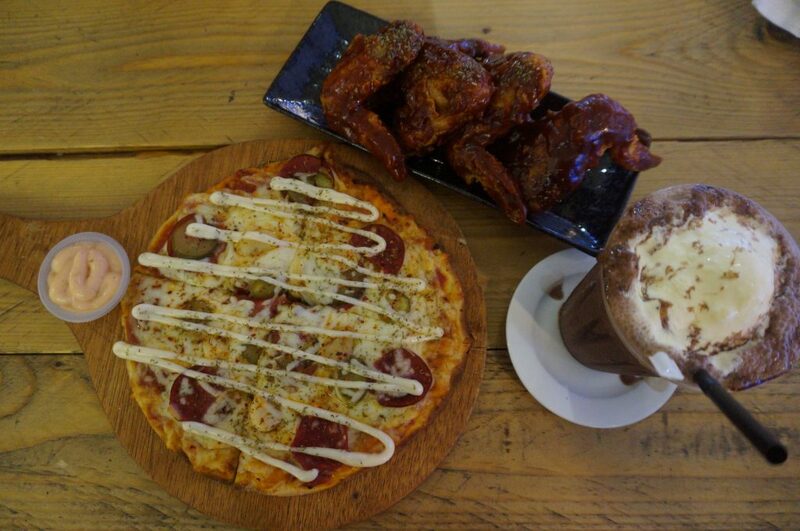 Pantry specializes in authentic pizzas while also serving up a variety of snacks and desserts that you are sure to love (I mean who doesn’t love pizza, snacks AND desserts, right!?) I highly recommended their Arabiatta pizza for those who love spicy flavours. The Arabiatta pizza is topped with a secret sauce, jalapenos, garlics and chili flakes. Their breakfast pizza is a bestseller too! So, if you are not fan of spicy food, I suggest you try it out. The breakfast pizza is topped with pronto sauce, beef pepperoni, sausage, mushroom, egg yolk and beef bacon! The cost of meals here depends on the size of the pizza. You have a choice of small for RM13.80 and large for RM22.80. Bubur Sentosa, located in Taman Sentosa, will definitely change your perspective on bubur (porridge in English) because it is certainly THE BEST, yup I said it, the best bubur in Johor! It is not your typical type of bubur that is served to you when you are sick. It is the type of bubur that will create a bubur addiction once you have tried it! So, what makes this bubur so special? Well, Bubur Sentosa is served with sambal, kangkung goreng belacan, kacang, jeruk cepoh, sambal ikan bilis, salted fish and salted egg. If all of those side dishes were not enough, you have the option of ordering add-ons such as lala (clams) that will make this dish even more mouthwatering. My favourite thing about this place is the service. Even when the place is crowded with people, your bubur will be surely served within 10 minutes! Ili Sakinah loves to lepak at mamak and definitely go with teh anytime, anywhere!